Florian Heilmeyer: Sonja and Jan, you know each other from your time studying together at the Akademie der Bildenden Künste Stuttgart [the Stuttgart State Academy of Art and Design], and Jan and Björn met when you both worked with Arno Brandlhuber and Bernd Kniess in Cologne. But actually it was a slightly odd passion for collecting that brought you together: the photo collection Bauten der Zwischenstadt [Buildings of the In-Between City]. Jan Theissen: After graduating from college I worked briefly for a retail fit-out contractor. Back then I was driving a lot through the region surrounding Stuttgart. And I noticed these quirky commercial villas: strange hybrids—very sturdy and resilient buildings—which had often been altered and expanded several times. I started taking pictures of them; Sonja was enthralled by it, and we spent several weeks in the summer systematically traveling across the countryside. Later, we showed them to Björn, who was as fascinated with them as we were. Björn Martenson: In 2006 I had a teaching position at the university in Aachen, and we created a design course about this building type. FH: What kind of course was it? BM: It was primarily an experiment. We were interested in whether a design strategy could be derived from the analysis of these buildings. Students were to design a commercial villa. JT: However, hardly anyone was interested in that type of everyday architecture in 2006. SN: Our colleagues at the university asked why we were interested in that—they said it was ugly! We quickly realized that it was better to talk with artists about it. They were much more interested in our findings. FH: You speak of “types.” What were you looking for exactly? SN: At first we were simply following our fascination. 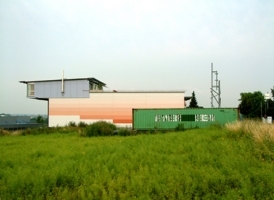 We took photographs mainly in industrial and commercial areas. What particularly attracted our attention there were the buildings where people worked and lived at the same time: an amalgam of living and working, like when you think of old farmhouses or the homes of craftsmen. People work downstairs and live upstairs. We were interested in both formal and conceptual aspects: for instance the roofer who covers his whole house with roof tiles, on one hand, to display his product and, on the other hand, also because it’s the material that he knows very well and can install himself. This particular building type was also interesting because it’s not part of a predefined collection of types; in architectural theory, such hybrid forms do not exist. FH: Purely in visual terms, there’s a strong connection between this collection and your architecture. Your buildings—even the new buildings—always have something peculiar, something slightly tangled up and ambiguous. To what degree does your collection influence you in your architectural work? SN: It’s never about copying something we’ve found or transferring it one-to-one onto one of our projects. The buildings that we photograph are seldom well done in terms of architecture or design. But there are certain aspects or details that fascinate us. Figuring out what interests us about these buildings sharpens our perception of everyday life and also expands our repertoire of possible forms, materials, and constructions. BM: One develops an entirely different sensibility and suddenly discovers the qualities of places and buildings that are far too often thoughtlessly disregarded by others. FH: So you expand your design repertoire that way? JT: Yes, because our consideration of simple types means we have a vocabulary of forms and types in mind that do not only come from modern architecture. SN: Architects often preclude the entire premodern repertoire—roof forms, for example—for their work and thus restrict their means of expression. Why, for example, should we limit ourselves to flat roofs when our architectural language is actually more diverse? We’d like to rethink how modern construction might look once we’ve gone beyond the necessity of building flat roofs. We don’t want to rule out anything; the idea is to have as large a vocabulary of shapes and materials as possible. JT: We want to develop an approach that’s as non-dogmatic as possible. And observing everyday buildings in our environment plays a major role. FH: But how do you transfer the fascination for everyday architecture to your own designs? 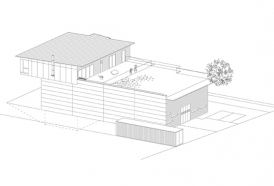 Could you perhaps explain that by using your latest project, Schreber House, as an example? BM: I knew the clients, a family with three children, who were looking for a house. But they didn’t want to subordinate their lives to financing their new home, so the budget was relatively low. Above all they wanted a big garden. 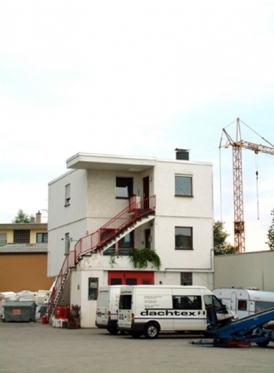 So the task was to find a suitable existing building with a large lot. We ultimately found this old brick house where an old lady had lived up until recently. The house was in poor condition. It was more of an “ugly duckling” in the way it perched above the large lot, separated from the garden by a one-and-a-half-meter-high base. FH: Did the clients also immediately see the potential of the ugly duckling? BM: No [laughs]. But we were able to show it to them. FH: That links up directly with your photo collection: recognizing the qualities of an everyday condition. SN: Our perception of seemingly everyday buildings is undoubtedly really well developed due to our passion for collecting. The spatial configuration of the old, small house was cramped and dark, but basically good. By building the addition, we were able to open the house to the garden, and with few new openings we were able to get more light into the existing building. The generosity that the house now has is something that surprised our clients very much. FH: The building seems homogeneous in a strange way, even though it consists of entirely diverse parts. JT: The house is actually a duplex. The other half of the house has also been altered and expanded with a winter garden and a terrace overlooking the garden. Our design relates to both the larger unit, that is to say the duplex house, and to the small unit. In that respect, the building is anything but an alien form, and that’s what gives you the impression of homogeneity. BM: I believe it’s the contrast that accounts for the power of this architecture. The dark, old brick house with its small openings and then the addition with its full-height glazing. It was important to us to not didactically separate the old from the new, but to interweave both. 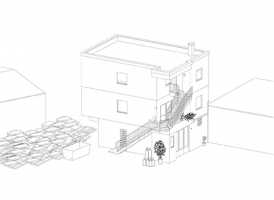 The addition is meant to combine smoothly with the existing building and expand the old house toward the garden. The split is visible, but it’s not the central theme; it’s more a matter of visibly joining things together. SN: We reused the old bricks that we got from razing the old shed and making the new openings. BM: We take what exists and weave it into what we make. FH: Isn’t that a contradiction: wanting, on the one hand, to “weave” the existing into the new and, on the other hand, to emphasize the dividing line between old and new? JT: If someone performs surgery or knits something together, a seam or suture emerges that slowly disappears over the years as the façade develops a patina. It’s intentionally not a celebrated joint or a dividing line. It’s about the continuum—the weaving-in of the new that occurs here, for instance, by carrying forward with the same materials. FH: Your newly constructed buildings – like the JustK single-family house or the cemetery pavilion, Fried—also look as if they have already undergone alterations. FH: I think so, but I don’t exactly know why. Maybe because the buildings simply don’t appear so “finished.” Maybe because they seem so eclectic, as if several designers had already worked on them. Or because they seem so solid, as if they are invitations to making additions or alterations. 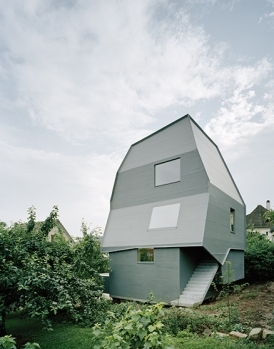 SN: Architects often think that their buildings must be finished or perfect upon completion. But what does finished mean? In everyday life, at any rate, very often you see houses with seams, traces of alterations and additions that have been plainly left visible. BM: Such seams, where they are left visible, spawn a depth of information in which the development of the architecture becomes more intelligible. Just as unfinished buildings are often more intelligible and sometimes even more stimulating than finished ones. That’s because you can still see the splits, the basic material, and the means of construction before it’s all concealed. SN: Once buildings are gradually used and incur the first signs of wear, they become as exciting as the unfinished buildings. JT: In the way it evolves, the process of constructing a building is actually like an inverse of the process of its falling into disrepair or being dismantled. Like the patina, the condition of “pre-finished” also documents the history of the object and makes it legible. With the Schreber House, the rough materials, which have been left visible, emphasize the surfaces and establish—much like a patina that develops on surfaces and objects over the years—a lively texture. As a result, the surfaces appear less “new” and gain both plasticity and vitality. It’s much the same with JustK. FH: So is it a matter of generating a certain accessibility, a familiarity, and in so doing, avoiding the aura of a finished, inapproachable product? BM: Our buildings have an aura. But not an inapproachable one. JT: It’s more about creating buildings or spaces with their own character. It’s okay for this character to seem a little weird—after all, people are often also somewhat peculiar, and usually they’re interesting for that very reason. The ground floor and the upper floor of JustK are certainly not “neutral” spaces but very special ones. 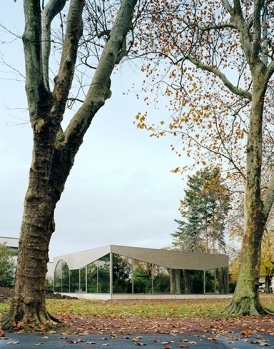 It’s the same with another one of our projects, a pavilion in one of the cemeteries in Düren: on the one hand, it seems like a classic modern building: flat, angular, and with lots of glass, very transparent. Inside, however, there are no neutral spaces, but three entirely different ones with archetypal roof forms: barrel, polygonal, and shed. We’ve made these inner spatial forms visible from outside, a little bit like the buildings in Bernard Rudofsky’s Architecture Without Architects—or like dug out caves. We’re interested in a mixture that’s capable of being read in multiple ways, a mixture that is allowed to appear contradictory and thus develops its own independence. FH: Can your projects be read as tongue-in-cheek irony directed against contemporary architecture? SN: No. It’s meant quite seriously [laughs]. BM: We have often been accused of that tongue-in-cheek attitude. But actually we aren’t being ironic at all. SN: Not one of our projects has been about designing the flashiest house. On the contrary! 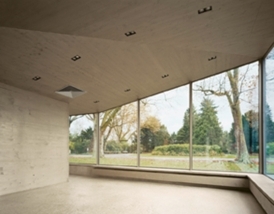 Our buildings always relate very strongly to certain characteristics of their surroundings. It’s about understanding the natural and built environment as well as the social links in order to “weave in” the new. What is newly built should become a part of the context. JustK, for instance, is located in a neighborhood where there are many houses with pronounced roof forms. Our roof form resulted from the house’s internal organization, but viewed urbanistically, this form—which seems a little quirky and conspicuous in the photos—fits into the neighborhood very well. If it weren’t completely covered with gray roof tiles, it wouldn’t be particularly striking, and people would probably just drive past it. BM: Our buildings respond to the requirements placed on them and to the aspects of the surroundings that we consider influential or important. What emerges is a special character that can perhaps seem quirky. JT: The real question is, which elements are picked up from the context and what is derived from them? Or: what inspirations can be used again, and where? We also use our photo archive quite associatively, in order to reestablish certain images in an entirely different context. For the Schreber project, we had pictures of buildings from Greece and the Palatinate that also played a role. BM: Perhaps pragmatism is married to the desire for complexity. Ultimately, it shouldn’t merely just be simplified. FH: Would you describe your architectural strategy as pragmatic? JT: Pragmatism is not our central theme. The cheapest option is almost always a white plasterboard wall. But our buildings are intentionally unfinished and rough in many places. That’s not pragmatism due to a low budget; it’s intended precisely that way. SN: Our architecture is more like gingerbread; it’s regarded as a fundamentally German product, but it’s a combination of German bread with exotic spices that came to Germany along the trade routes. In our architecture, something entirely independent is also meant to emerge from highly diverse ingredients, from local traditions, and other influences. JT: In the end, it can no longer be separated: from the mixture of totally diverse things, a new discrete entity emerges. visibly converted several times. The architects underscore the fascination exerted by these buildings with meticulous drawings that capture and closely examine even minor details.